Dr Hari Upadhyaya is the head of the ICRISAT genebank which safeguards more than 126,000 crop samples including 14,000 of pigeonpea. The ICRISAT genebank safeguards pigeonpea accession number ICP 8863, which was released as ‘Maruti’ in Karnataka in 1986. 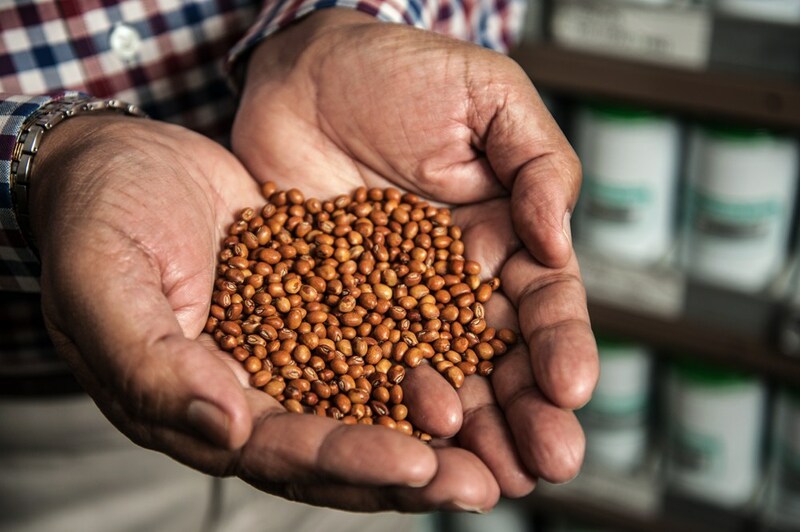 Dr. Hari Upadhyaya, the Head of the ICRISAT genebank, showed evaluations for the pigeonpea accession ICP 8863, a direct release from the ICRISAT genebank which help revitalize the Indian pigeonpea industry. Gulbarga, officially known as Kalaburagi, is the home of the pigeonpea (thoordal). 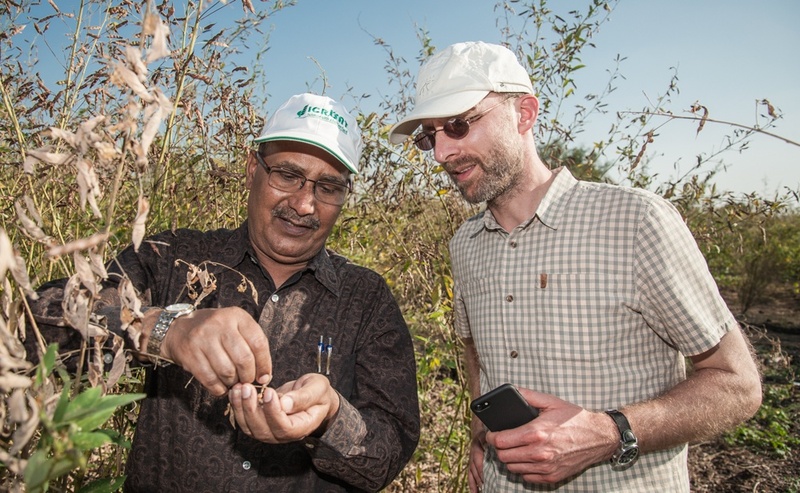 Benjamin Kilian and Michael Major, joined ICRISAT’s Head of Genebank, Dr Hari Upadhyaya, on a field visit to India’s pigeonpea breadbasket region of Gulbarga. 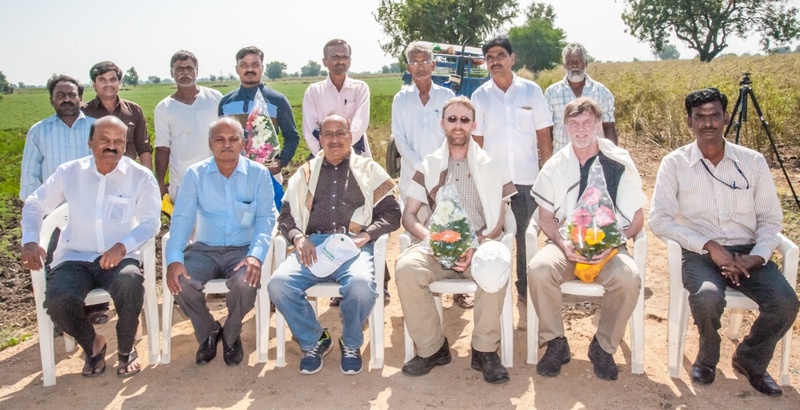 They met with several pigeonpea famers including Basavaraj Patil (left front row), and were joined by Dr JR Patil, Dean, and Dr S Muniswami, Assistant Professor, of University of a Agricultural Science, Raichur. Dr. Sonnappa Muniswamy has been a pulses breeder for 12 years and works out of the Agricultural Research Station in Gulbarga. Mr. Sharanappa Pujari has grown Maruti in his fields for 15 years and carefully selects the best plants for seeds for next year’s planting. Mr. Sharanappa Pujari with his neighbor, Abdur Rahman, who declared he would plant 20 of his 28 acres of pigeonpea to Maruti in the next growing season. Leaf drop from pigeonpeas help to enrich the soil. 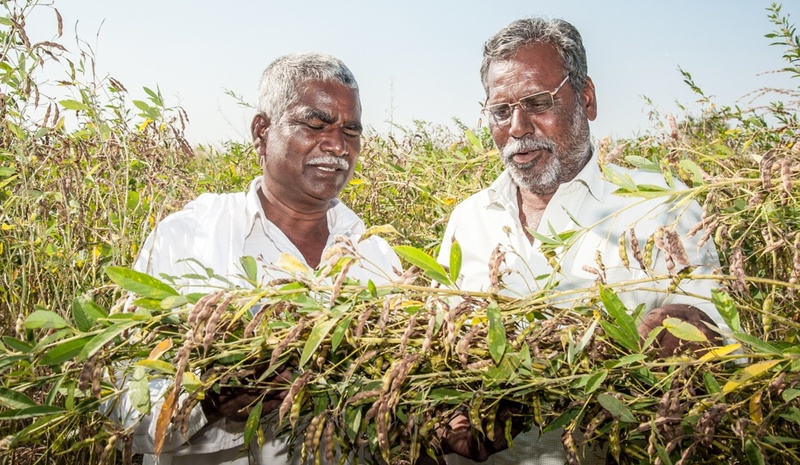 Mr. Devendrappa Berji, of the Srinivas Saradagi village, in Gulbarga Taluq grows 10 varieties of pigeonpea in a participatory project to evaluate lines with the University of Agricultural Science, Raichur. Dr. Hari Upadhyaya of ICRISAT and Dr. Benjamin Kilian of Crop Trust, examine pigeonpeas in Gulbarga. Mr Jumberlal Khandelwal, owner of Yash Proteins Pvt. Ltd. pigeonpea processing mill in Gulbarga, Karnataka, India. 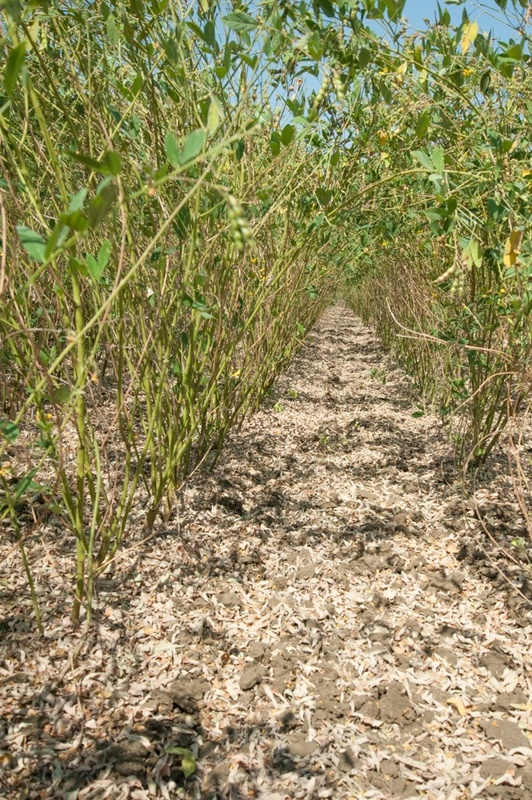 Pigeonpeas at Gulbarga’s Yash Proteins mill after drying in the sun. The office of Jumberlal Khandelwal of Gulbarga’s Yash Proteins pays homage to Maruti, son of the wind god. Mr. Ramalinga G. Kotagi, of Gotur Village, Chittapur Taluq, Gulbarga District (Center) with two neighbour farmers. Mr Kotagi has planted six acres of Maruti foundation seed production. ICP 8863 is one of 3.6 million accessions listed on Genesys, the global portal to information about Plant Genetic Resources for Food and Agriculture (PGRFA). Sharanappa Pujari’s face started to glow when I asked him how the pigeonpea variety, Maruti, had helped him to prosper. He spoke quickly in Kannada, the predominant language of the Indian state of Karnataka. “Achchhee cheei,” he kept saying. A farmer next to me interrupted Sharanappa and started shouting out in excitement. I eagerly awaited a translation to see how such a simple question could generate such emotion. Dr. Hari Upadhyaya, the head of the genebank at the International Crops Research Institute for the Semi-Arid Tropics (ICRISAT), translated for me. “Achchhee cheei means ‘a very good thing’,” Hari said. He explained that Sharanappa told a story about how he has been planting the wilt-resistant Maruti for 15 years on his farm and had prospered. He sent his children to university, constructed a three-bedroom home and even bought a gold chain for his wife. 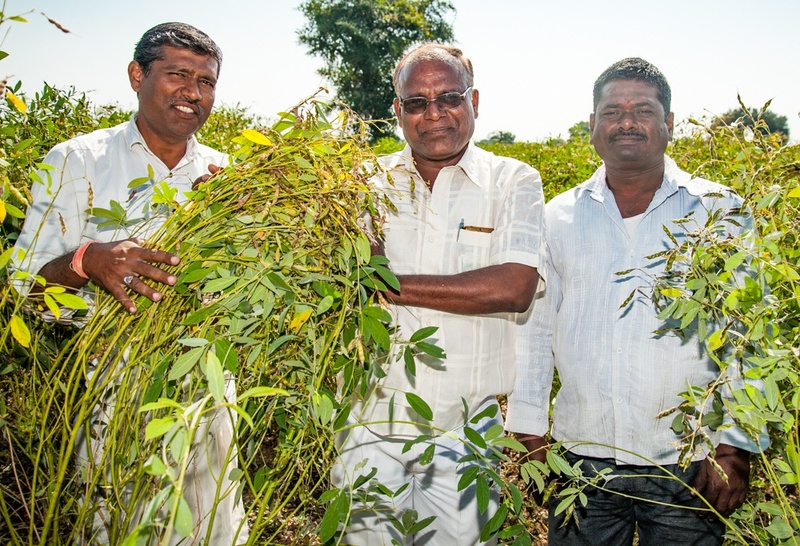 Sharanappa’s success with Maruti had prompted his neighbor, Abdur Rahman, to enthusiastically declare that in the next growing season he would plant 20 of his 28 acres of pigeonpea with Maruti and hoped to have similar prosperity as Sharanappa. 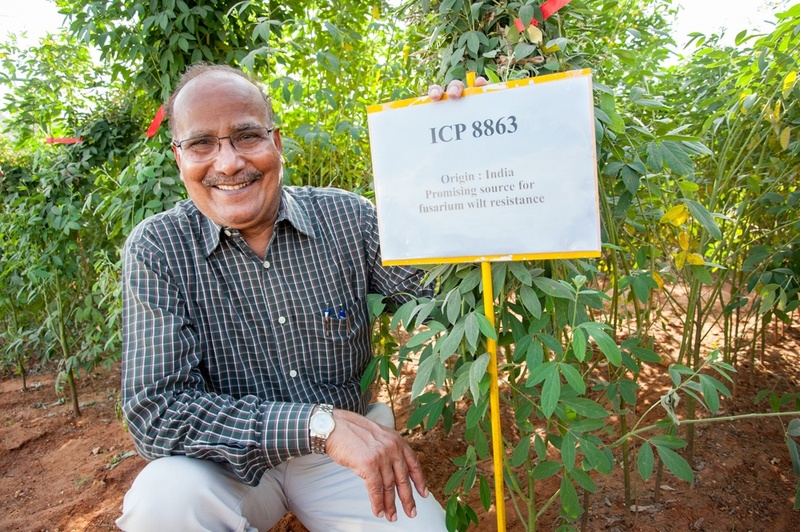 Several months earlier, Hari had told me the story of ICP 8863, a pigeonpea line released from the ICRISAT genebank. The story of ICP 8863 intrigued me so I travelled to India with my Crop Trust colleague, plant genetic resource scientist Dr. Benjamin Kilian, to see the long-term impact of the release of ICP 8863 where it matters most: in farmers’ fields. ICP 8863 was released as Maruti in 1986 at a time when the pigeonpea industry in parts of India was being hit hard by Fusarium wilt. 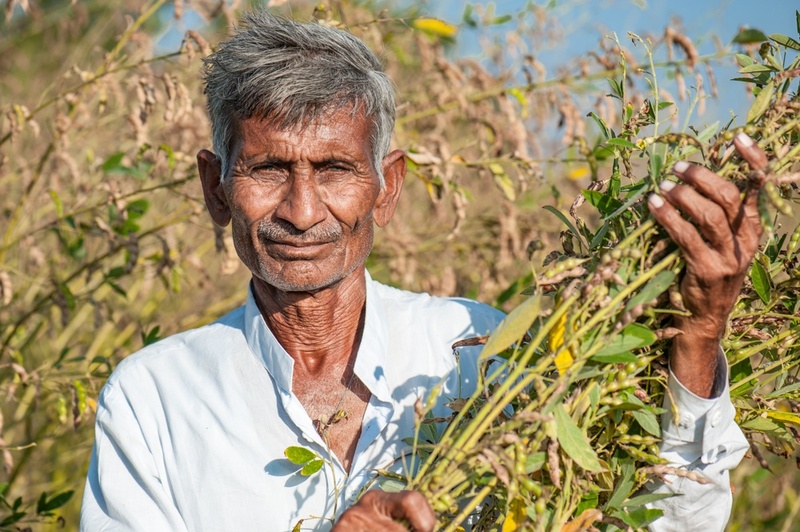 Within a few seasons, Maruti helped revitalize the pigeonpea industry and today, 30 years after its release, it is still being planted and is still a preferred variety in areas at risk of wilt. On arriving to India, I realized I knew very little about pigeonpea (Cajanus cajan). In fact, I had never even eaten it. Hari brought Benjamin and me to a vegetarian restaurant and, as we ate pigeonpea dahl, Hari told us about the crop. Hari showed me where the story of Maruti began: the RS Paroda Genebank at ICRISAT. The genebank is one of 11 international genebanks which comprise the Genebank Platform, a partnership between the Crop Trust and CGIAR. The ICRISAT genebank safeguards more than 126,000 accessions, or individual samples, of crops from 144 countries. Among those accessions are nearly 14,000 samples of pigeonpea. The genebank is Hari’s second home and as he proudly showed me poster displays highlighting the impact of direct releases from the genebank, I asked him about his career. “How long have you been curator of the genebank?” I asked. Hari stopped abruptly, turned and raised a finger. “I am not a curator. I am not a manager. I am a genebank scientist.” For Hari each and every one of the thousands of seeds in his genebank is a science experiment. Curators count and manage but Hari wants to delve into the secrets that each of the seeds in his genebank contain. “But I’ve been the head of the genebank since 2002,” Hari said with a smile and tapped in a code to open a door. Hari opened the door to the medium-term storage facility and ushered me in. Countless rows of neatly labeled and barcoded tins safeguarded their content – thousands of samples of seeds of crops important to the semi-arid tropics. He checked some numbers and pulled out a drawer. “Ah, here it is. The famous ICP 8863,” he said as he opened a tin and poured out some dark reddish brown seeds into his hand. 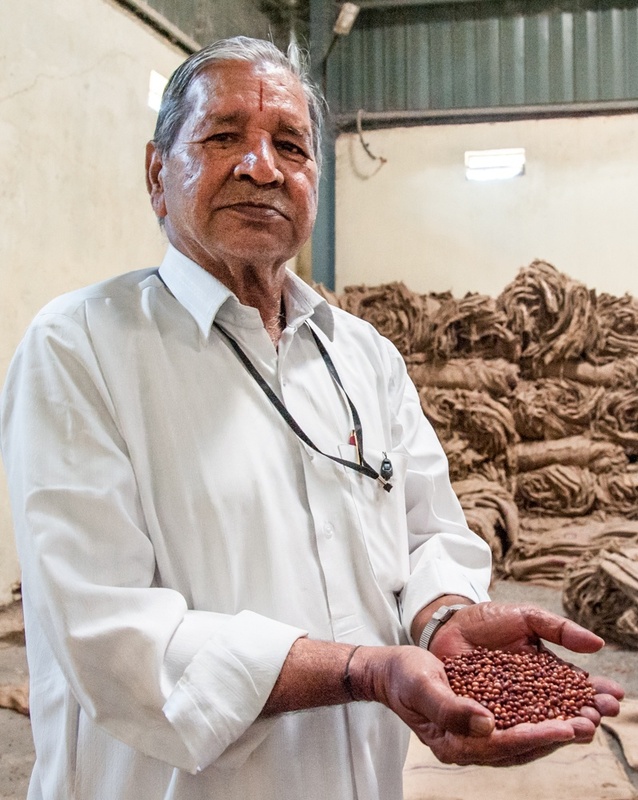 “This is where Maruti began its journey.” I stared at the seeds and struggled to comprehend how a few seeds which looked no different to the hundreds of other pigeonpea seeds in the ICRISAT collection could have revitalized an industry. Hari and I stepped out of the cool storage room and he told me of the early days of ICP 8863. Hari emphasized that the ICRISAT genebank has promoted the testing and release of 101 accessions directly as 138 cultivars in 52 countries. “It took 11 years from the time the progenitors of ICP 8863 were first collected in farmers’ fields until its release as Maruti in Karnataka,” Hari said. The progenitors of ICP 8863 were first selected from a landrace, ICP 7626, from Badnapur in Maharashtra state in India in 1975. Between 1978 and 1983, ICRISAT carried out screening in different locations to identify lines with broad-based wilt resistance. Of the large number of lines tested, five appeared promising. They showed resistance to wilt in different locations and for many years. “To answer that, we must travel to Gulbarga,” Hari said with his characteristic huge grin. Hari, Benjamin and I departed early morning from the ICRISAT campus near Hyderabad and headed due west to the Indian state of Karnataka. After travelling five hours we pulled over to the side of the road to get a closer view of a sign arching across the highway. 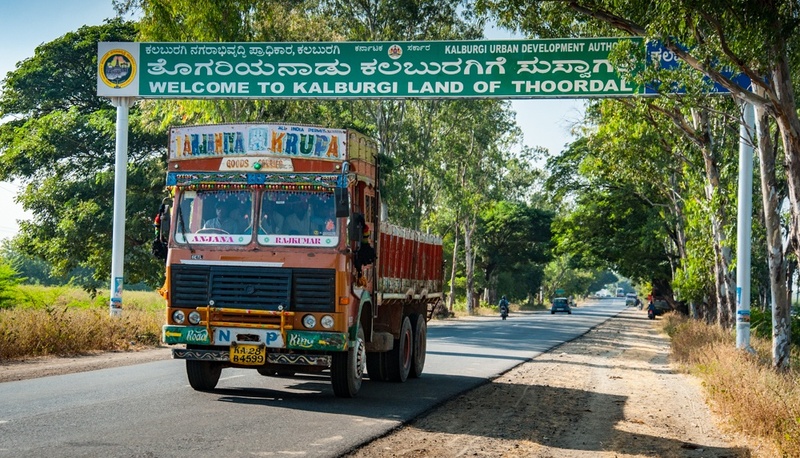 “Welcome to Kalaburgi, the land of Thoordal,” Hari said. Thoordal is the local word for pigeonpea and we were indeed in the heart of the pigeonpea growing region. Gulbarga, which is officially known as Kalaburagi, has been called India’s pigeonpea granary. We rendezvoused with Dr. JR Patil, Dean of University of Agricultural Sciences, Raichur, who spoke of the agricultural situation in the mid-1980s in Gulbarga. 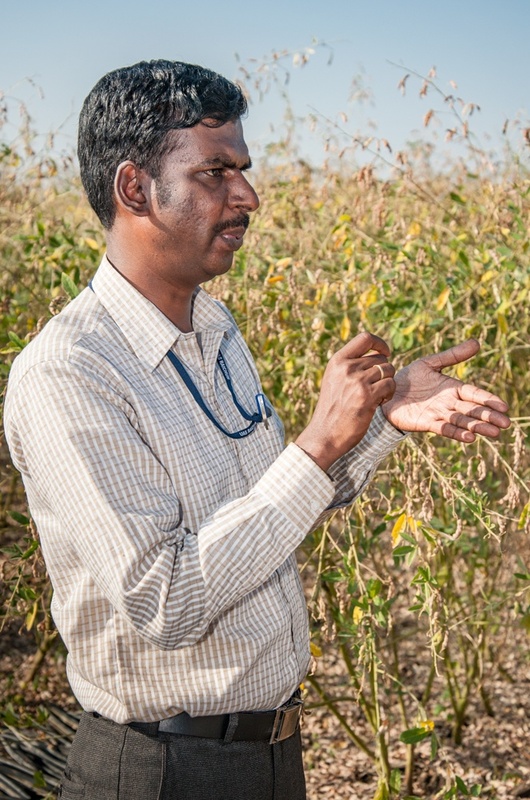 “Pigeonpea was commercially cultivated in the Gulbarga district in the 1970s; earlier, it was mainly cultivated for household purposes,” Dr. Patil explained. “Every few years, farmers would plant pigeonpea since it is a nitrogen fixing crop and can improve soil fertility.” However, pigeonpea would be used much more than as a soil enricher and soon became one of Gulbarga’s principal commercial crops. Production losses mounted, and farmers sought wilt-resistant materials from the Gulbarga Agricultural Research Station of the University of Agricultural Sciences. Scientists from the station approached ICRISAT, who by this time was recognized as the main source of disease-resistant pigeonpea lines. Fortunately, ICRISAT was well advanced with its multi-location screening of wilt-resistant pigeonpea. Scientists at the Gulbarga Agricultural Research Station, who initiated the release of Maruti, estimate that the ready availability of the ICP 8863 material from ICRISAT essentially shortened their R&D lag by 50%. “When ICP 8863 was released in Karnataka it was named Maruti,” Dr. Patil said. Maruti is the Hindu god Hanuman, the son of the wind god. I was itching to see the proof of the pudding. I had never seen pigeonpeas in farmers’ fields and was keen to actually see Maruti. Dr. Patil joined us as we formed a convoy of vehicles and drove along dust dirt roads until we were surrounded by pigeonpeas. Basavaraj Patil, a farmer from Udagi village, greeted us at his field. He stood amongst some of the 20 acres he had planted to Maruti. I asked Basavaraj why after 30 years he was still planting Maruti when so many other new and improved varieties were available. Across the road, Basavaraj had planted another 20 acres to a different pigeonpea variety and I questioned why he did that instead of planting only Maruti. The visits showed us Maruti was still making an impact in farmers’ fields, but I wondered if these gains were indeed transferred to the market as farmers had told us. To find out, we travelled to the Yash Proteins pigeonpea processing mill in Gulbarga. 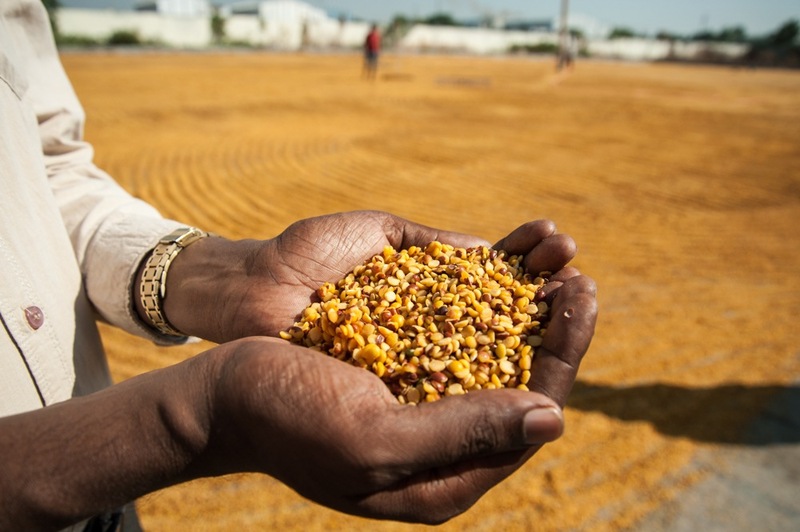 We stood in the sun and watched workers rake an orange sea of pigeonpea seeds. “I wish all the farmers would bring in Maruti for processing,” said the mill’s owner, Jumberlal Khandelwal. “We pay top prices for Maruti because of its taste and milling properties.” Jumberlal invited us into his office for tea and I looked at the wall behind me. 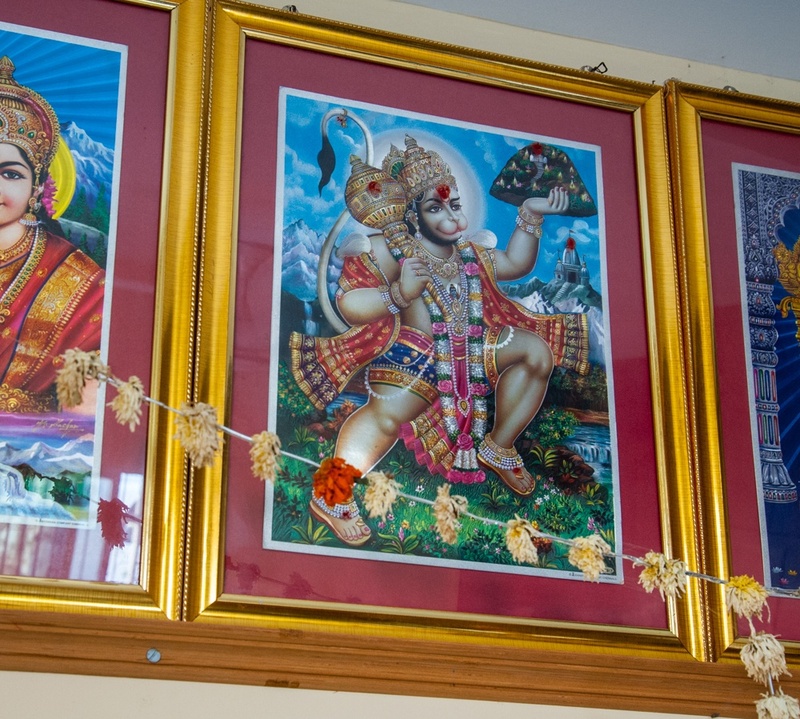 Maruti had indeed rewarded Jumberlal and he recognized that by placing an image of his benefactor on the wall. Thirty years after its direct release from the ICRISAT genebank, Maruti is still clearly having a big impact on the economy of Gulbarga. But what about next year, I wondered? Will farmers continue to plant it? To find out, we travelled through endless acres of pigeonpea fields to the east of Gulbarga until we reached the village of Gotur. 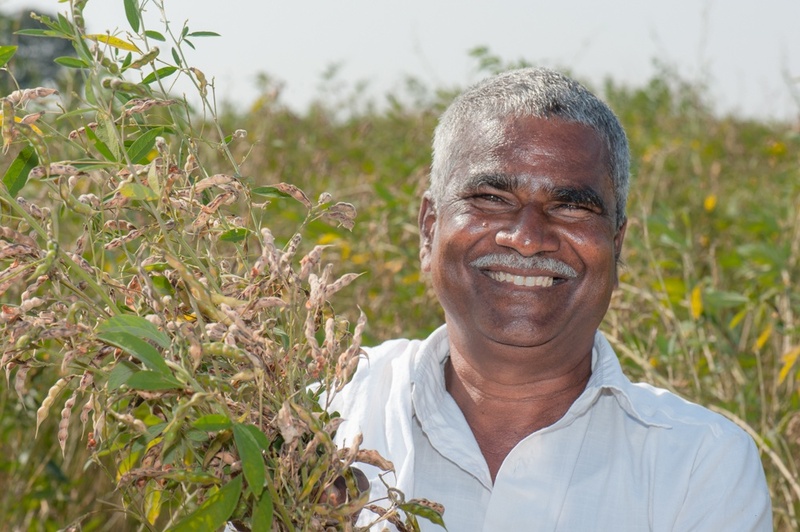 Ramalinga Kotagi, a local farmer, was awaiting us in front of six acres of pigeonpea. I looked out across Ramalinga’s field and could see why he appeared happy. His field of Maruti was looking very promising and as a foundation seed grower he would receive 10% more than the market value of pigeonpea. As we drove back from Gulbarga to Hyderabad, I kept thinking back to that little tin of seeds in the genebank that Hari had showed me. ICP 8863 was just one of 14,000 pigeonpea accessions which ICRISAT safeguards. 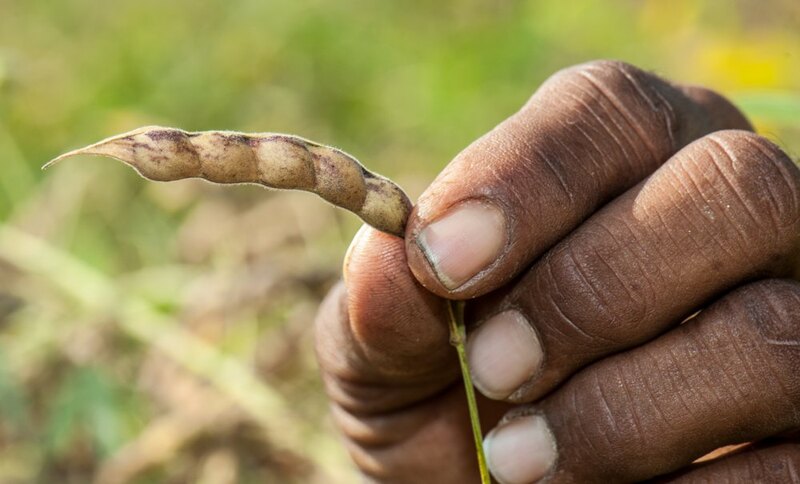 Any one of those could hold a special trait that could help pigeonpeas become resilient not only to wilt but also any number of stresses caused by a changing climate, like drought and heat ,which will no doubt challenge farmers in the coming years. I was comforted to know that around the world genebanks like ICRISAT’s had the foresight to save those potential Marutis.